the novel The Daughter of the Doctor and the Saint. 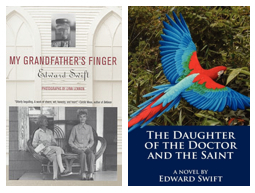 Edward Swift is an artist and the author of the memoir My Grandfather's Finger, in addition to several acclaimed novels, most recently, The Daughter of the Doctor and the Saint. Recorded in his studio in San Miguel de Allende, Mexico, the conversation ranges from the Orphic journey to Texas's Big Thicket, Marguerite Young, Proust, Greenwich Village, and the wonders of Mexico's little-known Sierra Gorda. Recorded on Feb 22, 2012. Your comments are always welcome. Write to me here.